The Department of Co-operative Governance and Traditional Affairs in KwaZulu-Natal says it's provided all families affected by severe storms in Ladysmith with temporary accommodation. MEC Nomusa Dube-Ncube says emergency provisions also include cooking equipment and mattresses, utensils, food and temporary shelter. Dube-Ncube provided the update in Durban yesterday. She said a join operations centre has also been set-up in the area. Some 70 houses were completely destroyed on Saturday night, leaving 400 people destitute. Dube-Ncube says practical assistance will continue until affected residents are in a position to begin rebuilding their lives. 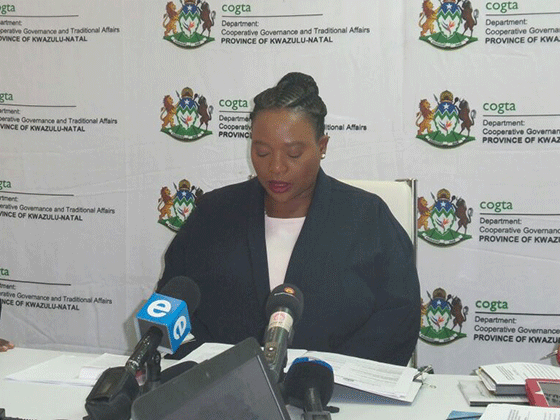 COGTA estimates damages could be in the tune of 10-million-rand. Meanwhile, Dube-Ncube says despite recent storms - much of the province remains caught in the grips of drought - including the uThukela District where the storm occurred at the weekend. COGTA says combined dam levels across the province are at just 55 percent.